Wednesday the club did a couple of hikes centered on Praying Hands. Dana and Deb led a new route, and Joe led the old standard. I had afternoon conflicts, so took the short route which I’ve written about here previously a couple of times. So I’ll dispense with the narrative and just post a couple of shots which illustrate the old explanation that photography is really all about chasing light and shadow. First a panorama looking towards the Four Peaks area, as the broken clouds highlight a mid-distance rock formation. The second shot presented itself on the trip back down off the mountain, when I looked back and noticed this striking sundog in which the sun is hidden behind the mountain, projecting a halo into the hazy sky above the peaks. The shot may seem to have been shot in low light, but it was actually about 10 in the morning. 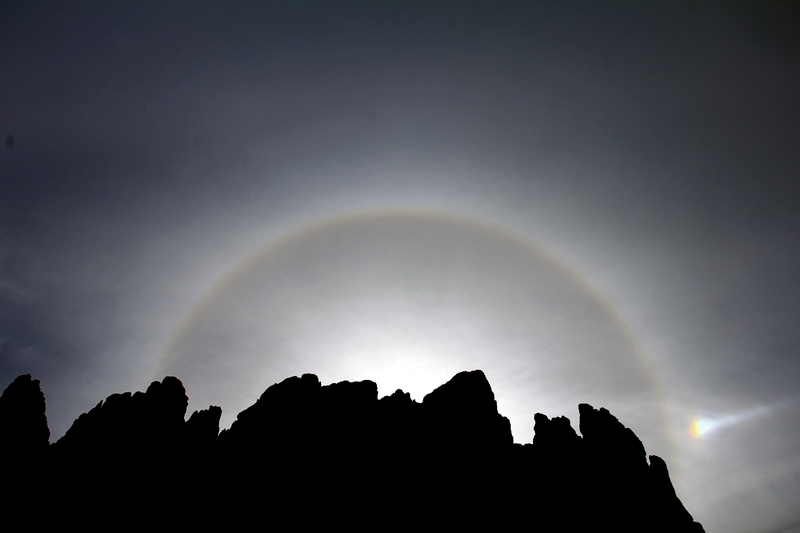 I used a very high shutter speed and a polarizing filter to capture the halo which was much more subtle in “real life”. This entry was posted in Arizona hiking and tagged Praying Hands. Bookmark the permalink. It is an awesome photo, even though I did not understand how you got it…You are an awesome photographer. Thanks, Coleen. You flatter me. If you click the shutter often enough……..
There’s more to Hans than meets the shutter. Excellent.